IRISH WORKERS WILL not be affected by Tesco’s plans to “simplify” how it runs its largest stores. The biggest change in the restructuring plan will see the removal of the People Manager and Compliance Manager roles at the supermarket chain’s large stores and fulfillment centres. 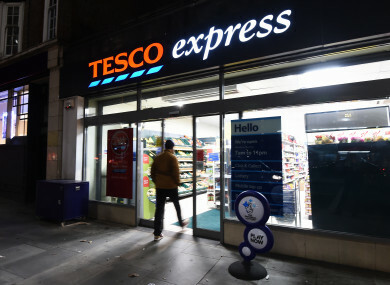 Tesco announced the move today saying that the 1,700 people whose jobs are being put at risk will be able to apply for 900 new jobs with “broader remits”. A spokeswoman for the retail giant told TheJournal.ie that no Irish jobs will be affected by the shake-up. Tesco CEO for the UK and Ireland, Matt Davies, said: “These changes remove complexity and will deliver a simpler, more helpful experience for colleagues and customers. We recognise these are difficult changes to make but they are necessary to ensure our business remains competitive and set up for the future. “Our priority now is to support affected colleagues through these changes in any way we can. We hope to retain as many colleagues as possible in the new roles we have created and in the vacancies we currently have available,” Davies concluded. Last year Tesco axed 2,300 jobs at its UK call centre and head office as part of a cost-cutting initiative. Email “Irish jobs unaffected by significant shake-up at Tesco”. Feedback on “Irish jobs unaffected by significant shake-up at Tesco”.